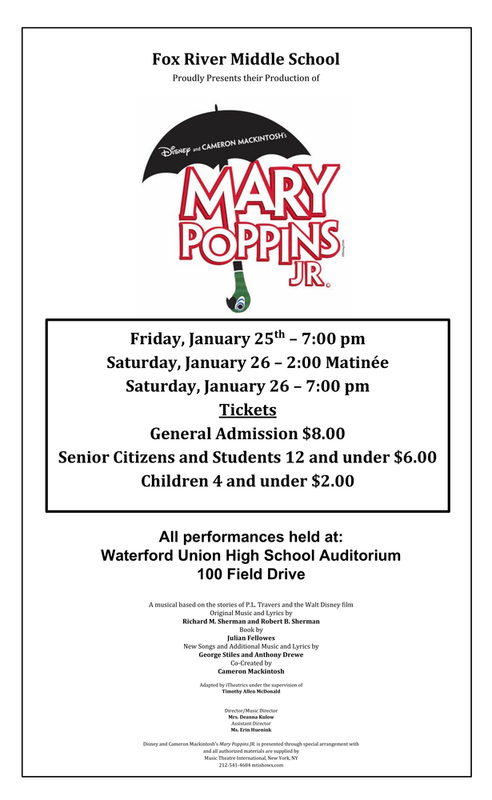 Fox River Middle School proudly presents Mary Poppins Jr. You and your family are invited to view the fine talent from our middle school students. This musical is based on the stories of P.L. Travers and the Walt Disney film Original Music and Lyrics by Richard M. Sherman and Robert B. Sherman Book by Julian Fellowes New Songs and Additional Music and Lyrics by George Stiles and Anthony Drewe Co-Created by Cameron Mackintosh.